Music surrounds us during almost every activity. Whether you’re shopping for groceries, waiting at the dentist’s office or riding in an elevator, music is always around you. But ask yourself this, do you really listen to this music, or simply hear it? Chances are, you’re doing the latter. Why is the distinction between hearing and really listening so important? For many of us, learning to listen intently or focusing our undivided attention on music can benefit many areas of our lives. As I’ve observed in thirty years of teaching active listening and classical music appreciation, when people begin to really listen to music, they are able to have an emotional and psychological connection with a piece. This connection can have tremendous benefits on mental health – not unlike those of meditation. For those of us looking to find balance in our fast-paced lives, I argue that music can be a key tool in achieving a more mindful state. So how does one learn to be more present using music? I’ve outlined seven steps below to help you do just that. Give yourself a fighting chance. Fighting and being present may seem incongruent or even incompatible, but they are actually not. Anyone who has mastered a martial art form will agree it is essential to be totally present while engaging in physical discipline. To be fully present, it is absolutely necessary to “disarm” by silencing electronic devices, cell phones and anything that may take your mind away from listening to music without distraction. Prioritize uni-tasking over multitasking. No matter how proud we might be of our ability to multi-task, this behavior will be of no help whatsoever in being present with music. All distractions must be put aside. We cannot listen while also reading, writing, eating, texting or watching TV. Converse with the music. Classical music was meant to be listened to without distraction. When someone like Beethoven composes, it is similar to writing a personal letter to someone about a matter important to us and to them. Just as we hope the recipient of our letter will carefully read every word and absorb the flow and connection of our thoughts and feelings, composers of classical music felt the same about their work. Their music was composed with the hope that the listener could give their undivided auditory attention to each musical sound as it is produced without distraction or interruption. I think of this as “having a conversation” with a composer. Focus on the elements. Having made a decision to listen with all of your faculties, you might ask: “What do I focus on? How do I become present?” The answer is to focus on the rhythms, melodies, harmonies, contrast of loudness and softness, the different sounds each instrument or group of instruments makes and the form. Pay attention to these changes and similarities. Are some melodies repeated? Are they repeated identically or altered? Get emotional. While you may be used to the emotional meaning of a song being bound up in the lyrics, wordless abstract music can elicit a myriad of feelings in the listener. Classical composers created such profound abstract music that it often causes people to have unusually intense, often cathartic emotional experiences while listening to their compositions. Embrace your emotions as they come and go. Keep your focus. If your mind begins to wander – not to worry! Thinking unrelated thoughts is normal when trying to be present with music. When that happens, gently bring your mind back to noticing the melody and the instruments that are playing. Enjoy the contrasts of loudness and softness as they occur in real time. Once you shift your attention back to the music, your internal monologue will quickly dissipate. Your presence will instead be filled again with sounds far too interesting to be ignored. 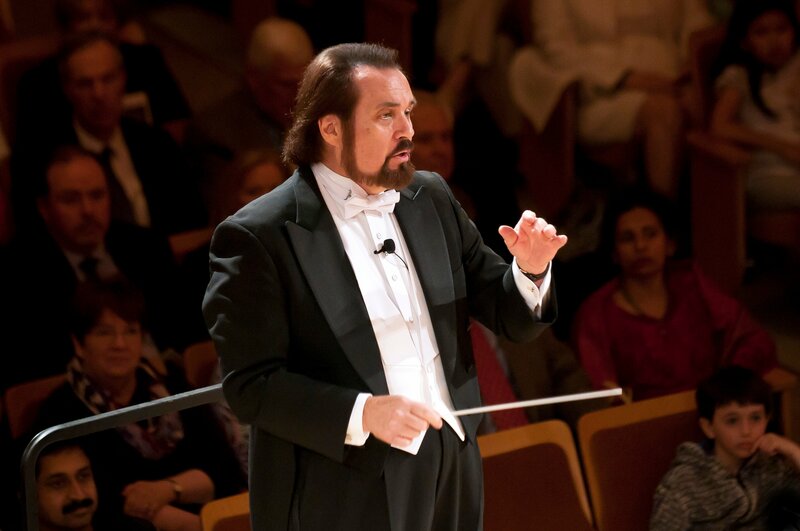 Maestro George Marriner Maull is the Artistic Director of The Discovery Orchestra, a nonprofit music education organization teaching the listening skills to help people better comprehend, experience and emotionally connect with classical music. For more inspiration, you can check out The Discovery Orchestra’s YouTube page or stream their Emmy-nominated program “Bach to the Future” on Amazon. George Marriner Maull is a conductor, violist, television host and music educator with over 50 years of experience as a professional classical musician. He has conducted at Carnegie Hall, Lincoln Center and venues in Europe and has recorded for the Naxos label leading the Polish National Radio Symphony Orchestra. Founder and Artistic Director of The Discovery Orchestra, a nonprofit music education organization, Maull has devoted his career to making classical music accessible. He has helped millions of individuals around the world develop the active listening skills to deeply connect with music and become "virtuoso listeners." Maull is the writer and host of three Emmy-nominated television programs broadcast by American Public Television. He is a regular lecturer at the New Jersey Performing Arts Center and throughout the New York metropolitan area. Maull formerly served as the music director of the Philharmonic Orchestra of New Jersey, the Louisville Ballet and the New Jersey Youth Symphony. He has played under the direction of celebrated musicians including Igor Stravinsky, Pierre Boulez, Sir Georg Solti, Arthur Fiedler, Aaron Copland, Lukas Foss and Robert Shaw and studied with Robert Smolensky and Lawrence Widdoes at The Juilliard School. A native of Philadelphia, Maull received both his Bachelor and Master of Music degrees from The University of Louisville. Headshot courtesy of L.D. Bright Photography.